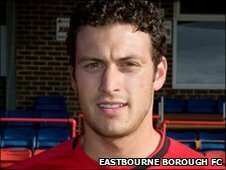 Eastbourne Borough defender Gary Elphick says the side must keep their concentration and avoid naivety in order to regain their good run of form. The Sports have lost their last two games and currently stand 14th in the Blue Square Bet Premier table. The 24-year-old told BBC Sussex: "As soon as you get complacent and switch off for a millisecond you'll be punished in this league. "We've got to learn a little bit and maybe not be so naive." He added: "We need to keep setting the bar higher and higher. I'm sure we'll get back on the training ground and put things right. "I really want to close the gate with our goal and defend really solidly. Set pieces are causing us a bit of trouble at the moment. "We'll get more and more confident as games go by." Boro welcome Darlington to Priory Lane on Saturday.